Namur is a modest city, but its position at the meeting of two great rivers, the Meuse and Sambre, has raised its status both for trade and military significance. And the city’s main sight is the vast old military citadel - one of Europe’s mightiest fortresses. The best places to stay in Namur are in the pretty old town just below the fortress and along the banks of the two rivers. If your idea of the best place to stay requires a certain level of history and drama you’ll not be disappointed. The old town has plenty of great choices and is also full of cafes and restaurants and is largely pedestrianised. As well as the citadel, its sprawling outbuildings and underground network of tunnels and escape routes, Namur also has a nice art museum and an archaeological museum. Citadelle de Namur, the mighty fortress at the centre of the town. The Gurus best places to stay in Namur make the most of great hotels in town and out of town. 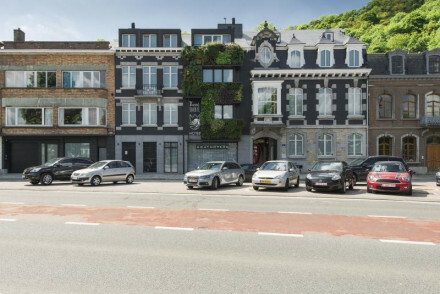 The Royal Snail is an intimate hotel close to the river with an outdoor pool, spa, gym, atmospheric Belgian restaurant and a beautiful vertical garden. The decor is unusual and eclectic and celebrates the history of Namur. Ne5t Hotel & Spa is a beautifully revamped Belgian farmhouse outside historic Namur. The six rooms are stylish and minimalist with exposed brick and simple whitewash. The spa has a hydrotherapy pool and there’s also an outdoor pool. If you think that you'd prefer self catering accommodation, we recommend you check out the wide selection with our online partner Booking.com. Best time to visit is between May and September with temperatures varying from 18-23 degrees. If you wish to hire a car, we recommend you visit our partner Rentalcars. Browse through our list of all the best places to stay in Namur. Intimate and eclectic hotel close to river Meuse. Unique rooms honour Namur's history, and have wooden floors, flat screen TVs and modern bathrooms. Outdoor pool, spa, gym and beautiful vertical garden. Innovative Belgian cuisine in atmospheric restaurant. Something different and good value. A beautifully revamped Belgian farmhouse on the outskirts of Namur. Rooms are stylish and minimalist, with exposed brickwork ceilings and simple white washed walls. Indulge in the superb hydrotherapy spa and relax by the lovely outdoor pool. Perfect for a detoxing weekend away. Total relaxation - An ideal destination to recharge your batteries, with spoiling suites, fantastic spa facilities, and a lovely garden pool. Sights nearby - Citadelle de Namur and Saint-Aubin's Cathedral are within twenty minutes walk.